BERLIN--(Marketwire - Nov 1, 2012) - BIOTRONIK, a leading manufacturer of medical technology, today announced that the company's AlCath® Gold ablation catheter enables faster, more efficient ablation procedures. Lesions created by a standard catheter in 60 seconds only take 40 seconds to create with these novel devices -- without compromising patient safety. Results of the study, which investigated the ablation time efficiency of gold catheters, are published in the Journal of Interventional Cardiac Electrophysiology (JICE)1. Conducted at the Budapest University of Technology and Economics in Hungary in cooperation with Erasmus Medical Center Rotterdam, Netherlands, the study investigated in vitro lesion formation in relation to ablation time and power delivered using 4-mm, nonirrigated, platinum-iridium catheters versus gold-tip catheters. Results showed that gold-tip catheters can create the same excellent lesions in 33.3% less ablation time. There was no difference in tip temperature due to the temperature-controlled settings, but a considerable difference was observed in the mean power delivery. Because the gold alloy possesses a thermal conductivity that is four times higher than the platinum-iridium used in conventional catheters, it allows greater energy delivery with a lower tip temperature. "The results have a high relevance for clinical practice," explains Dr. Tamás Szili-Török, MD, PhD, Erasmus Medical Center, Rotterdam, Netherlands. 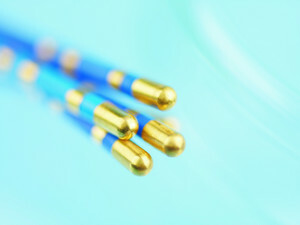 "We usually program temperature limits of 40-55°C for 4-mm tip catheters without gold. As soon as the tip temperature reaches the programmed maximum, the generator automatically decreases the power delivery. Gold-tip catheters, however, result in an increased energy transfer into the tissue, so the tip temperature is lower even though energy delivery is higher. This ultimately leads to reduced procedure times, helping the physician conduct ablations more efficiently." This latest data confirms results previously published from the AURUM 8 trial and proves the superiority of gold catheters.2 With a total of 463 patients, AURUM 8 was the largest randomized atrial flutter ablation study in the world. "BIOTRONIK is continuously bringing new solutions to market that help physicians excel in the way they treat patients in their daily practices," commented Christoph Böhmer, President International, BIOTRONIK. 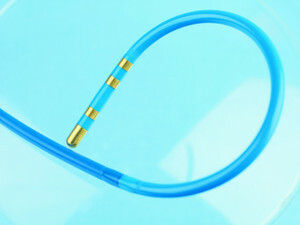 "BIOTRONIK's AlCath® Gold ablation catheter, made using 99.9% pure gold, provides four times greater thermal conductivity compared with platinum; maintains a cooler tip temperature; facilitates fast, efficient lesion formation; and reduces coagulation -- resulting in reduced catheter exchange rates during the procedure." As one of the world's leading manufacturers of cardiovascular medical devices, with several million devices implanted, BIOTRONIK is represented in over 100 countries by its global workforce of more than 5,600 employees. Known for having its finger on the pulse of the medical community, BIOTRONIK assesses the challenges physicians face and provides the best solutions for all phases of patient care, ranging from diagnosis to treatment to patient management. Quality, innovation and reliability define BIOTRONIK and its growing success -- and deliver confidence and peace of mind to physicians and their patients worldwide. 1 Tibor Balázs et.al, Journal of Interventional Cardiac Electrophysiology (2012), Ablation time efficiency and lesion volume. 2 Lewalter et al., Europace (2010), Gold vs. platinum-iridium tip catheter for cavotricuspid isthmus ablation: the AURUM 8 study. Upon publication, please provide us with a copy.